VENERATION OF THE VENERABLE CHAINS OF THE APOSTLE PETER. MARTYRS SPEUSIPPOS, ELEUSIPPOS, MELEUSIPPOS AND THEIR GRANDMOTHER LEONILLA, TOGETHER WITH NEONOS, TURBONOS AND JOVILLA (161-180). RIGHTEOUS MAXIM, PRIEST OF TOT'MA (+ 1650). MARTYR DANAKTOS THE READER (II). PRIESTMARTYR DAMASKIN THE NEW (+ 1771). 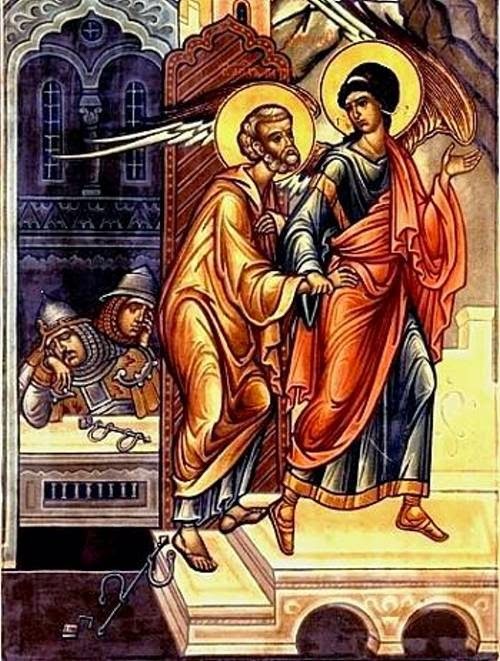 The Veneration of the Venerable Shackles of the Holy and All-Praiseworthy Apostle Peter: On the orders of Herod Agrippa, in about the year 42 the Apostle Peter was thrown into prison for preaching about Christ the Saviour. In prison he was held secure by two iron chains. By night, on the eve of his trial, an Angel of the Lord removed these chains from the Apostle Peter and miraculously led him out from the prison (Acts 12: 1-11). Christians who learned of the miracle took the chains and kept them as precious keepsakes. Those afflicted with illness and approaching them with faith received healing. The Chains of the holy Apostle Peter were kept at Jerusalem until the time of Patriarch Juvenalios, who presented them to Eudocia, spouse of the emperor Theodosius the Younger, and she in turn transferred them from Jerusalem to Constantinople in either the year 437 or 439. Eudocia sent one Chain to Rome to her daughter Eudoxia, who built a church in the name of the Apostle Peter and put within it the Chain. At Rome were also other Chains, in which the Apostle Peter found himself before his death under the emperor Nero. On 16 January the Chains of the Apostle Peter are brought out for veneration by the people. The Holy Martyrs Speusippos, Eleusippos, Meleusippos, and their grandmother Leonilla together with Neonos, Turbonos and Jovilla suffered in Galilee (by another account, in Cappadocia) in the Second Century, during the time of the persecution under Marcus Aurelius (161-180). Leonilla received Baptism in her declining years from one of the disciples of Saint Polycarp, Bishop of Smyrna, and she afterwards converted to Christ her three grandchildren. The brothers, out of their enthusiasm for the Lord, pulled down idols and reproached the pagans for their folly. The torturers, leading Leonilla to the place of execution, ordered her to say to her grandchildren that they should renounce Christ, but she in passing by them praised them for their bravery and their firm confession of faith. Then the martyrs were thrown into a fire, but it did not harm them. After the torturing and death of her grandchildren, Saint Leonilla was beheaded by the sword. Together with her suffered also Saint Jovilla. She beheld the unflinching faith of the holy martyrs and confessed herself a Christian, leaving behind an husband and young son. The torturers, having hung her up by the hair, lacerated her body and beheaded her. Saint Neonos beheld the exploits of the holy brothers, and having recorded their sufferings, gave his manuscript to Turbonos, and he openly confessed himself a Christian, for which he was fiercely beaten and died from his beating. Saint Turbonos, having copied out the exploits of the passion-bearers, also ended his life by martyrdom. These martyrs are particularly revered in Spain, where many churches are dedicated to them. The relics of the holy martyrs were given by the Greek emperor Zenon to France, in the city of Langre. Righteous Maxim, Priest of Tot'ma, was for a certain time priest in the city of Tot'ma in Vologda diocese. Over the course of forty years he made the harsh exploit of fool-for-Christ, constantly in fasting and in prayer. Blessed Maxim died in extreme old age on 16 January 1650 and was buried at the Resurrection church, in which he served. The local veneration of the saint began in 1715, in connection with numerous miracles occurring at his grave. The Holy Martyr Danaktos lived during the II Century and served as reader at a church in the locale of Auleneia in Macedonia. During the time of an incursion by non-believers the saint took the church vessels and intended to hide them, but he was seized by soldiers. Refusing to worship an idol, he was beheaded by the sword. The PriestMartyr Damaskin the New was born in the village of Gabrovo of Tirnovo diocese. As an adult, he left his fatherland and withdrew to Athos. He accepted monasticism there at the Khilendaria monastery, at which he later became hegumen. On needs of the monastery Saint Damaskin journeyed to Bulgaria, to the settlement of Sistovo. In fulfilling the entrusted task, he requested of Turks a repayment of debt, but not only did the Turks not repay the debt, they seized from the saint everything he had. Afterwards they charged him with abducting a woman (they brought her secretly to the gaol to him). Despite the defense of the ruler of the settlement, the Turks took Saint Damaskin to the gallows and gave him a choice to accept Mussulmanism. Not receiving agreement from the saint, the Turks hung him on 16 January 1771. The wrath of God did not hesitate to overtake the evil-doers, for in crossing the Danube River, the executioners drowned.